Safeway Inc. (SWY) held its 2009 annual meeting at its Pleasanton, California corporate headquarters. Shareholders were offered fruits and other food items on a large table. 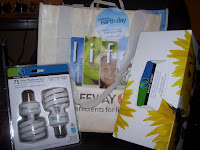 After the meeting, shareholders received a reusable bag with eco-friendly light bulbs and a box of tissues from Safeway's in-house brand, "Bright Green." Safeway ran its meeting professionally--there were no glitches, and everyone knew exactly what to do and when to do it. One way to measure a well-run meeting is whether the company allows comments on shareholder proposals. (Google did not, causing problems at its meeting.) Safeway passed this basic test--it allowed shareholders to comment on various proposals prior to closing the polls. It also limited comments on the proposals to two minutes. General Counsel Robert Gordon handled the business portion of the meeting. He started off with some jokes about politicians and lawyers, drawing laughs. He then moved on to the shareholder proposals. One shareholder submitted two proposals. The first dealt with cumulative voting. According to the SEC, "cumulative voting is a type of voting process that helps strengthen the ability of minority shareholders to elect a director." Put more simply, cumulative voting allows minority shareholders more power by allowing them to concentrate their votes on a single candidate. For example, let's assume you own 100 shares, and there are two director vacancies. Ordinarily, you could only vote 100 shares for each director; however, with cumulative voting, you could combine your votes and vote 200 shares for one director. This proposal failed. 1. Shareholder proposals should be binding, not merely advisory; after all, shareholders own the company and should be treated as owners, not advisory members. 3. Institutional owners should not be able to vote blocks of shares without express approval from their shareholders. (Shareholder Shelton Ehrlich pointed out this might require shareholders who hold mutual funds to sift through hundreds of corporate proxy statements each year. I've seen similar shareholder proposals, including one that required institutional owners to abstain from voting at all.) This proposal also failed. The final proposal was submitted by Scott Adams (not related to Dilbert's Scott Adams) of the American Federation of State County and Municipal Employees Pension Plan Fund (AFSCME). I've seen Mr. Adams make similar proposals, seeking to ban "golden coffins." He is very effective because he speaks clearly and entertains his audience with humor and visual props, such as a gold-plated nail. "Golden coffins," which AFSCME wants to ban, reward executives and upper management for dying. (You read that right.) Many CEOs, upper managers, and their families receive cash payments when they die. In this case, Safeway also pays former executives cash if they die when they're not working for Safeway, i.e., during retirement. (Again, you read that right.) The key sticking point is that death benefits are unrelated to executive performance and therefore amount to a giveaway of shareholder money. This proposal received 38% of the vote. I agree with the proposal. If executives want death benefits, why can't they use their own ample salaries to buy themselves and their families life insurance policies? One would think after being paid millions of dollars, executives could afford a policy or an annuity. More important, there is no "pay for performance" element involved in this executive benefit. Companies offer it because other companies also offer it. It's never a good argument to do something because someone else happens to be doing it. Companies and their compensation committees need to understand that executive compensation has become a lightning rod for criticism. As a result, companies that offer excessive salaries and unnecessary benefits reveal how out-of-touch they are, and no one wants to invest in a company that's out-of-touch. CEO Steve Burd handled the rest of the presentation. I've never met Mr. Burd before, but I became a huge fan. He doesn't avoid questions, knows his company inside-out, is focused, and projects professionalism and confidence without arrogance. I have no doubt that Safeway would be in much worse shape if not for him. During his tenure, Safeway introduced "O Organics" and handily caught the organic food wave. It is now trying to capture the "green" consumer wave with its "Bright Green" product line. Safeway also offers a line of "Eating Right" products to help consumers eat more healthy food. Safeway's other product lines, like "mom to mom" and "Waterfront Bistro," would benefit from more advertising and promotion, but in time, they may become as successful as "O." It is easy now to admire the strength of Safeway's in-house products, but it is never easy to establish a brand. Under Mr. Burd, Safeway created its "O" brand in less than three years. That's remarkable. Mr. Burd was especially proud of how his company has managed healthcare expenses. He said Safeway had "flat-lined" healthcare costs, while its competitors had seen 38% increases in costs. Mr. Burd hasn't seemed to sacrifice quality, either. During the meeting, a Safeway employee and cancer survivor stood up and shared an emotional story about how Safeway helped her fight and beat cancer. Mr. Burd was recently invited to the White House to discuss his success in managing healthcare costs with President Obama. After going through various slides, Mr. Burd opened the floor to questions. A shareholder asked about Safeway's pension and whether it was underfunded. Mr. Burd said that market conditions had reduced the pension's assets, but under a 2006 law, Safeway has time to correct underfunding and increase contributions. (The law is the Pension Protection Act of 2006, and it appears that companies have seven years to correct underfunding). I asked questions about Safeway's relationship with its unions. I asked what percentage of the company was unionized (i.e., part of a bargaining unit). I also asked what made Safeway able to do so well while offering substantial employee benefits. I added that Safeway must have a special relationship with its unions because most unionized companies fail, or major tension exists between management and labor. One look at car companies (GM, Ford, Chrysler) and airline companies (Delta, Northwest, etc.) shows that unions tend to harm companies that rely on discretionary consumer spending. Safeway and other grocery companies seem to have dodged the union bullet. I also asked Mr. Burd what he was most worried about in terms of competition. Mr. Burd said he wasn't a worrier. He said, "I worry about my kids [not Safeway]." Coming from anyone else, this response might have seemed flippant or arrogant, but when Mr. Burd said it, he sounded sincere. He said his concern was a variant of the real estate mantra of "location, location, location." In his case, however, it was "sales, sales, sales." He pointed out that Safeway was in a unique position--it could borrow money at "less than 1%" interest. After a few other shareholders asked questions, the meeting ended. Before I go into my analysis of the stock, I want to commend Safeway's employees. Whenever I go into a Safeway, I receive excellent customer service. Every single time I've asked a question, a Safeway employee will go out of his or her way to help me. In an era where good customer service and just plain decent manners are declining, Safeway stands head and shoulders above most of its competition. I chatted with a Safeway employee on the way to the meeting, and he said he's worked for Albertson's before. He said Albertson's didn't have a good relationship with its union and its employees. I asked what made Safeway better. His response was classic: "Safeway treats me like a human being." Based on my own limited anecdotal evidence, I feel Safeway is doing exceptionally well when it comes to customer service and employee job satisfaction. The only other grocery store where I get a similar feeling is Nob Hill Foods, a Raley's division. But Safeway's biggest problem may be what I call the "curse of the middle." In almost every business catering to Americans, the "middle" players have been crushed because of America's steadily declining middle class. In retail, for example, Neiman Marcus and Tiffany (upscale players) have done reasonably well, as have Walmart (WMT), Ross (ROST), and Target (TGT) (cost-conscious players). Mid-level players, however, like Sears, Mervyn's, and Montgomery Wards, have gone bankrupt or are not major threats. The lesson to me seems simple--you either have to win on volume at the lower end of the scale, or on margin at the higher end. Safeway is a middle-level company, in size and focus. It's much smaller than Walmart and Target, but bigger than Whole Foods Market (WFMI) and Trader Joe's. Safeway's competition is focusing on specific customer niches to win market share, which may harm Safeway's profits. For example, Walmart and Target are aggressively expanding their selection of food products. Safeway's products are generally priced higher than Walmart's. If Walmart continues to expand its selection of food products, it could take business away from some of Safeway's cost-conscious consumers. Meanwhile, affluent consumers may already be going to Trader Joe's or Whole Foods Market instead of Safeway. Thus, Safeway is caught in the middle and may have to rely on cost-cutting to improve shareholder value. As great as Mr. Burd is, a company can only cut expenses so much, especially when it is heavily unionized. At the same time, Safeway has many positive factors. Most consumers will not buy their produce or food from Target or Walmart. There seems to be a built-in bias right now against buying food at Target or Walmart. Also, Safeway will remain competitive because it offers better quality, convenience, and service than Walmart, Costco (COST), and Target. I will continue to keep an eye on Safeway. If it maintains its dividend, it could represent a decent value play. Although Safeway stock probably won't ever be a large percentage of my portfolio, I will be rooting for Mr. Burd. At the very minimum, America can learn from Safeway's experience cutting healthcare costs. Disclosure: I own fewer than 10 shares of Safeway (SWY). Unions have nothing to do with companies failing. Bad products and bad management cause companies to fail. When people get a clue about how badly grocery stories really treat their workers, these grocery stores will begin to fail. They don't give employees sick leave anymore, until the third day you're sick. That means you've got sick checkers at work. Brilliant. They fire journeyman employees every chance they get. Workers are allowed one mistake a month, regardless of years of exemplary service. Safeway is one of the worst. They are even trying to take away basic holiday pay like New Years, 4th of July and Labor Day. The reason WE don't have good jobs is because WE worry more about ten stupid shares of stock than our working family and friends. Pierluigi Oliverio: My Kind of Politician? Lawyers Paid Not to Work?